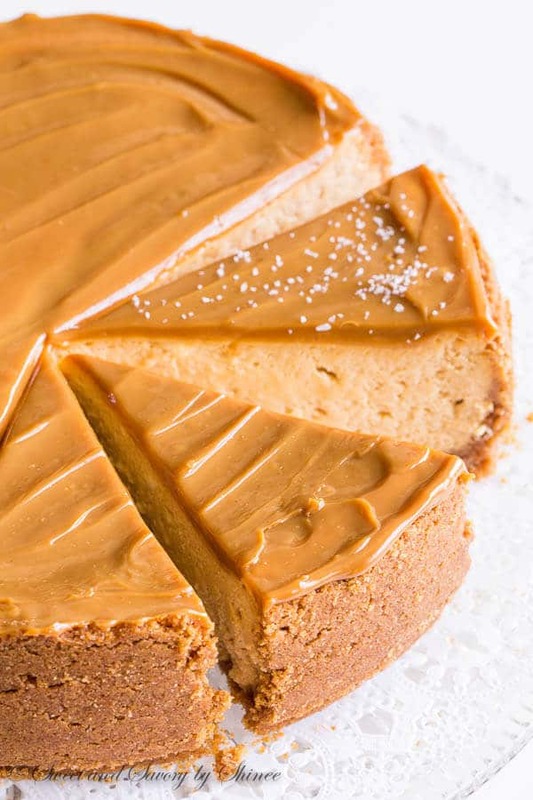 Sweet and creamy with touch of sea salt, this decadent dulce de leche cheesecake is quite a treat! All the steps are laid out for you in easy-to-follow visuals so you can achieve this decadent dessert right in your own kitchen. It’s no secret I love cheesecakes. The taller, the creamier, the better! And preferably with lots of crust. This time I made one with my all time favorite sweet treat: dulce de leche. I don’t know what took me so long to make this sweet deliciousness, but it did happen. Not once, but twice in one month! Don’t let the fancy name fool you. Dulce de leche is nothing but cooked sweetened condensed milk. It’s my addiction. So simple, yet so complex. It’s one item I always have in my pantry. Here’s what I do. I buy like 10 cans of sweetened condensed milk at a time (cashiers probably think I have a problem and they’re probably not far off! ), stock 5 of them in the pantry, and then boil the other 5 in a large pot of water for a few hours. Boiled cans of sweetened condensed milk are then cooled and stored in the pantry. Easy peasy, right? I shared more details of this process in this post, so I won’t go into too much detail here. Instead let’s dive into the cheesecake. Shall we? This cheesecake is massive! 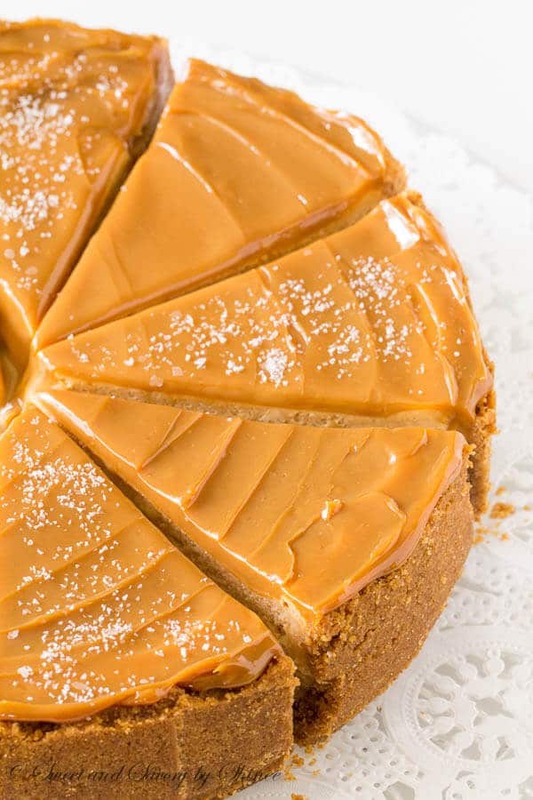 With tall, buttery, crumbly crust and smooth creamy cheesecake filling topped with more dulce de leche. To offset all the sweetness, sprinkle a little bit of sea salt! Decadent, truly decadent! This impressive cheesecake isn’t that difficult to make. All the steps are laid out right here for you. Start with softened cream cheese for the smoothest filling. Simply bring cream cheese out on the counter about an hour before you start. Bring out the eggs while you’re at it. When you start adding the eggs, don’t beat the batter on high speed, because you’ll incorporate too much air into the batter, which is #1 reason for cracked cheesecake. Before serving, I highly recommend sprinkling some sea salt on top, as it balances some of the sweetness of the cheesecake. I love this Maldon sea salt flakes, it’s the best stuff! Now, invite a few good friends for a coffee, or tea and bake this delicious cheesecake to indulge! Hope I got you craving some cheesecake. Quick question for you: What’s your favorite cheesecake flavor? Let me know in the comments below. 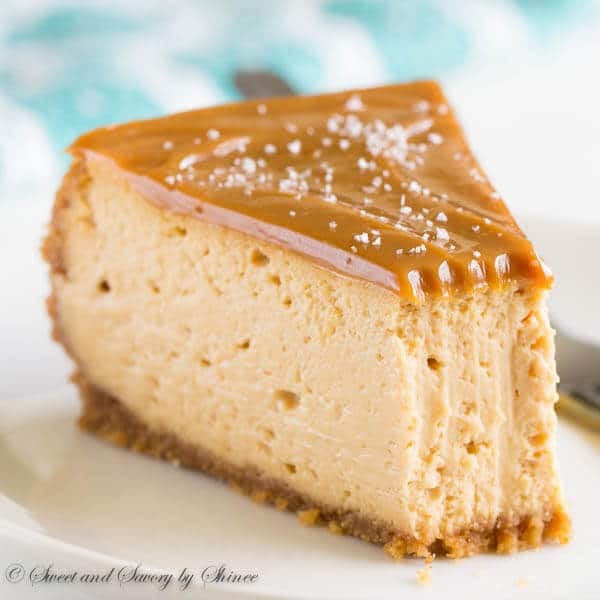 Sweet and creamy with touch of sea salt, this decadent dulce de leche cheesecake is quite a treat! 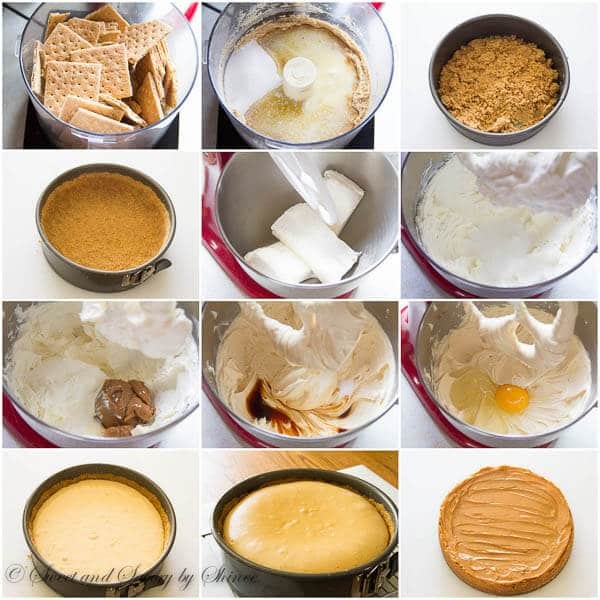 To make the crust, crush the graham crackers in a food processor until fine crumbs form. Add sugar and melted butter and pulse until the crumbs are evenly moistened. Transfer the crumbs into a 9-inch springform pan. Press the mixture onto the bottom and up the sides of the pan. Refrigerate while working on filling. To make the cheesecake filling, in a mixing bowl with paddle attachment, beat the cream cheese until fluffy on medium speed. Stir in the sugar. Then add about ¾ of dulce de leche (the remaining ¼ of the can will be used for spreading on top for decoration) and sour cream. Continue to mix until combined. Stir in vanilla extract and salt. Beat in the eggs one at a time and mix just until combined on low speed. Transfer the batter into the prepared crust. 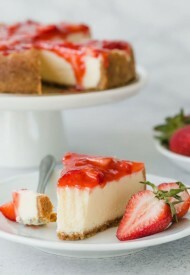 Bake the cheesecake for 45-50 minutes, or until the edges are set and slightly wobbly in the center. Cool on a wire rack for 10 minutes. Then carefully run a knife around edge of the pan to loosen; cool for 2 hours. Then refrigerate to set completely for at least another 2 hours. When ready to serve, remove springform sides of the pan and spread the reserved dulce de leche on top. Sprinkle some sea salt, if desired. Store the cheesecake in a fridge, covered, for up to 5 days. Made this today for my Brazilian daughter in laws birthday! It was delicious!! My husband said it was one of the best things I ever made and not to brag but I’m an accomplished cook and baker. I used nilla wafers instead of graham crackers but followed the recipe otherwise. Thanks for a wonderful recipe! And yes I made my own dulce de leche by simmering sweetened condensed milk in a pot of water for 3 hours -very easy and delicious also. Thanks for the recipe. I made it for my girlfriends mothers birthday and everyone loved it. Instead of the salt on top I drizzled chocolate over it. So happy you made this cheesecake and it was a success, Jerry. Thank you for your feedback! Hi Shinee, made the recipe and it was absolutely AMAZING!!! 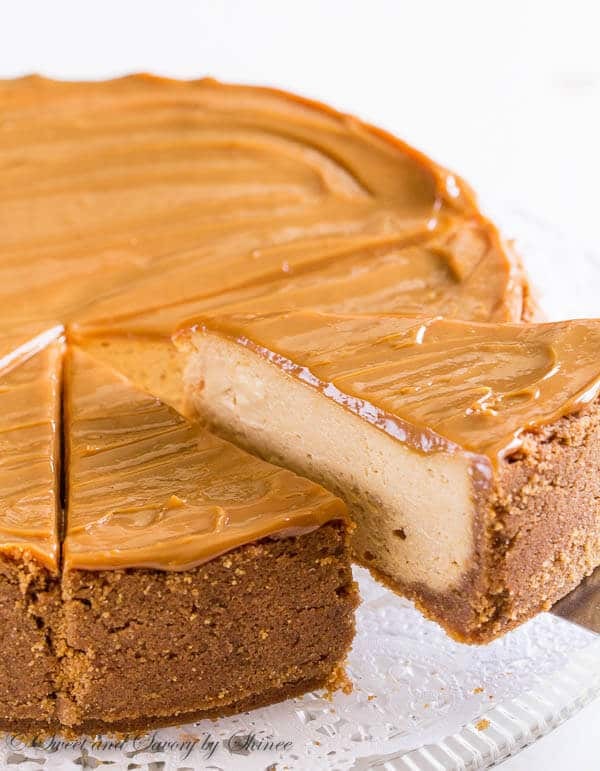 I would also like to make a plain NY cheesecake..what changes are there in the ingredients for the original cheesecake recipe? I made this cheesecake recipe, and I haven’t eaten it yet, but of course I got to taste a bit from the knife that I used to cut it. Tastes great! I am putting cajeta on top tomorrow before my friend’s birthday party instead of the rest of the dulce de leche to add the caramelized texture but to introduce a mildly different flavor with the dulce de leche cheesecake base! Hopefully a bit more complexity will help cut through the richness a bit? (As I don’t like putting salt on my sweets personally!) But the cheesecake base recipe is great! Drake, so glad you’ve tried and liked the recipe!!! Hope the birthday guest will love the cheesecake as well. And yeah, cajeta sounds delish too! Thank you for your feedback! Amazing recipe! 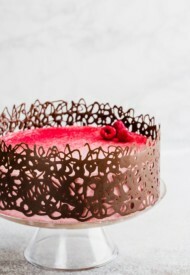 May aunt makes a cheesecake JUST like thisone and it makes all May family crazy! She never wanted to share the recipe though and now i found it! I am a pastry chef and this is definitely not sour at all, she probably used expired cream or measured something wrong. I encourage everyone to try it. Emilia, SO happy to read your feedback!! Thank you! Hi, Vivian. I don’t think you need to adjust baking time. It’ll be the same. I had a guest that could not have gluten so for my cheesecake bottom I used Honey Nut Chex mix which is gluten free. Crushed up chex mix and also added finely chopped pecans and melted butter. Wow it was great!!! This is the only cheesecake bottom I now use!! Oh my goodness, that sounds like amazing crust! I’ll sure be trying that, Lorraine. Thanks for sharing. Would you mind if I share that crust recipe with my next cheesecake recipe here on the blog? I can not wait to try this recipe! I didn’t know I could store unopened cans of dulce de leche in my cabinet! Definitely making a few extra cans. I like to cook them on low for 8 hours in my Crock-Pot. My family’s favorite cheesecake is hands down the Apple-of-your-eye Cheesecake by Taste of Home. Google it and try it, you will love it! Hi! I made two cans of dulce de leche last night and put it in the same container to store! I’m going to make the cheesecake tonight, but don’t know how much dolce de leche to put in! Do you have an approximate measurement? Thanks! Hi, Shanna. Sorry for delayed response. It’s about 1 cup of dulce de leche in cheesecake batter and about 1/4 cup for topping. Hope this helps. Thank you!!! I think that’s about what I put in. I’m excited to try it tomorrow! Great. Hope you enjoyed it today, Shanna. Yes! It is so good! I’ve made lots of cheesecakes, and my husband said this is the best one yet! Thanks for the recipe! Yay, so happy you guys enjoyed it! Thank you for your feedback! Hi – I am having a really hard time finding canned dulce de leche, and don’t have time to make my own. Have you ever used dulce de leche from a glass jar? Do you think that would work in this recipe? Hi, Alex. I don’t think there’s a difference between canned and glass jar dulce de leche. So I’m sure glass jar one will be just fine. But to be honest, I’ve always made homemade version. I made this recipe and everyone loved it. Yay, so glad you loved the cheesecake, Chris! Thank you for your feedback! Hi Shinee! 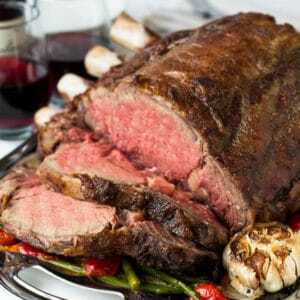 I really want yo try this recipe because it looks delicious! I have a pro and a con. The big pro is that as I live in Argentina dulce de leche is a very common thing to buy here… but the con is that there is no thing such as sour crean. Or it is very dificult to find in a market. My question is, can I replace it with another ingredient? Cecilia, hope you saw my response on IG that you can use greek yogurt in place of sour cream. Hope you’ll give it a try, and let me know how it turns out. Thanks! This cheesecake was terrible! It tastes sour! Seriously, the worst thing I’ve ever tried. Interesting. I’m wondering what could have caused extreme sourness? The little bit of sour cream in the recipe sure won’t cause that much sourness, so I’m pretty puzzled. You did add only half cup of sour cream, right? Sorry to hear yours turned out that way, Sarah. But thanks for leaving your feedback. Yes, I followed the recipe exactly. It wasn’t extremely sour, just sour. It’s just not a good recipe. Did anyone else actually make this? Yeah, that’s weird. No one in our family found it to be sour. I’m just baffled why yours turned out sour. And I’ll also say, if I found the recipe bad, I don’t post it. I’d be curious to hear others’ opinion too, if anyone tried it. I buy dulce de leche at our local grocery store in the mexican isle, its sooo good and no need to use all that electricity! The cheesecake looks really good! Great pictures! You should try dolce de leche macarons, sooo good! Hi, Olya! I’ll have to check out our local grocery store for dulce de leche. Thanks for the hint! 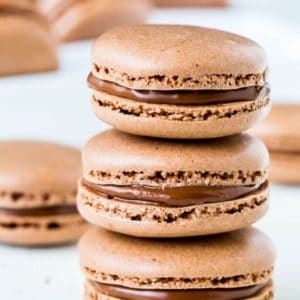 And yes, dulce de leche macarons are awesome. 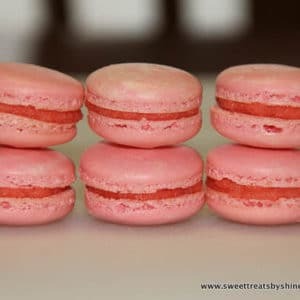 I sometime use it as filling in plain macarons. I should make a new variation for the blog though. 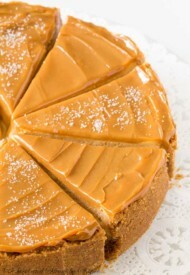 Hi, how do you make the dulce de leche from the condensed milk? Hi, Cenk! I’ve shared all the details in this post (scroll to the middle and you’ll get my tips there). I’m wishing the same thing. 🙂 Thanks, Jess! Thanks, Erin! Yeah, agreed on chocolate cheesecake. This one is just as good though. I really appreciate your cheesecake making tips! I haven’t made a cheesecake in a very long time, so it’s very helpful! oh my gosh! what i wouldn’t do for a slice now Shinee! looks AMAZING. So decadent, but worth every calorie! This looks fabulous and your pictures are stunning! Aww, thanks so much, Kristen! I totally agree, calories were totally worth it! I learned how to make the condensed milk caramel from a Peruvian friend of mine and it quickly became one of my favorites! I love any excuse to use it, and love that you put the Maldon salt on it to help balance the sweetness! I can’t wait to try this! 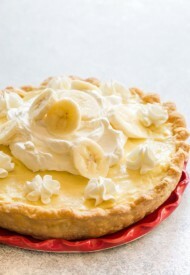 This looks absolutely delicious and like a great dessert for parties! I think i may be making this soon! 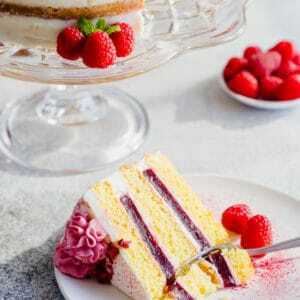 Perfect for parties as it’s such a rich dessert. Hope you give it a try, Safira. Thanks! Oh my gosh, this looks amazing!! I love dulce de leche, I can just eat it by the spoonful, so I just know I would love this! Me too, I eat it by spoonful on the regular. Thanks, Annie! 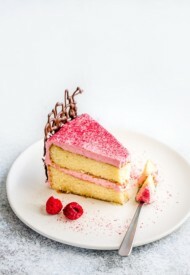 This cake looks so pretty and tasty! I love Dulce de Leche! This looks absolutely fabulous! 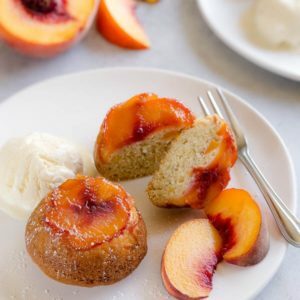 My dad is the baker in the family – I’m sending him this recipe to make!! That’s awesome, Mary Ellen. Let me know you guys get to try it. Thanks for visiting!